They say a picture is worth a thousand words. Yet, a picture is not always enough in customer service. In those cases, support videos are the answer. YouTube has shown the world that a how-to video can be worth 51 million subscribers or more. The online video platform created an entire industry out of how-to (support) videos. YouTube subscription numbers show that how-to content is the most popular type of videos it features followed by music videos. Support videos convey what standalone photos, email, and customer service chats cannot. By using video, these three forms of communication can be integrated into one package. It’s a modern, visual version of a website’s FAQ page. With the creation of screen recording technology, companies can quickly make visual step-by-step guides that answer customers’ questions. In three easy steps, companies can record their screen, narrate the instructions, and share the videos on their customer service platforms. Support video has become an integral tool for companies such as AgoraPulse. 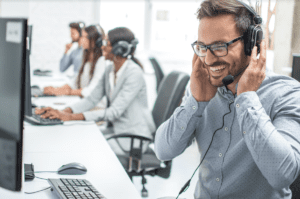 This social media marketing platform company uses Screencast-O-Matic to integrate screen recordings into every aspect of its customer experience. 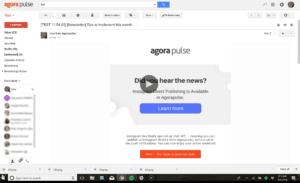 Visual: Screen recording technology captures AgoraPulse on the computer screen as a customer sees it. Vocal: Narration added to the screen recording walks customers through the step-by-step support video. Concise: To keep it simple, videos are short (90 seconds to four minutes) and focus only on one topic. Marketing email: When new clients sign up, the company sends a welcome email to them. The email includes links to three video tutorials. Screencast-O-Matic’s video platform was used to create each instruction guide, which aims to get clients up and running quickly with topics such as publishing posts and downloading analytics reports. Troubleshoot: Each section of its help guide includes support videos or screen captures. The images show real examples from their social marketing platform. The images are enhanced by adding graphics from Screencast-O-Matic’s video editor. Quick guide: Screen captures offer users a seven-step picture guide to their platform. 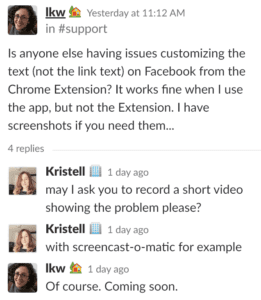 Support videos can also easily integrate into other customer service platforms. Companies that use Freshdesk or LiveAgent can quickly add video to their correspondence with customers. Video can be uploaded or embedded onto both platforms. Try creating a 90-second tutorial to respond to future tickets. It’s likely to yield better results than wordy email instructions. Olark also has support video capabilities. For example, create a tutorial or troubleshooting video by using a screen recording. Then send it via Olark to help customers resolve their issues. Support videos also give perspective. Customer service seeks to understand what a user is experiencing. Video provides an optimal way to show exactly what the user should be experiencing. The video visual bridges any communication gaps often created by customer-service chats or phones calls. Auto-generated ticket responses are often impersonal. However, adding video to customer-service tickets gives auto-responses something new — a personality. Support videos are the perfect opportunity to add a face to your customer service department. Screencast-O-Matic allows you to record picture-in-picture of you and your screen. Merging the two creates a personalized video that can be attached to tickets and chat features in Olark, LiveAgent, and Freshdesk. In the future, to provide an optimal customer-service experience for your clients, skip the PDFs and lengthy email instructions. Instead, personalize customer support by adding video to your customer-service toolbox. Then watch your company’s efficiency, communication, and user reviews improve.